(From left) George Harris, Hart High School principal from 1949-65, and C.M. 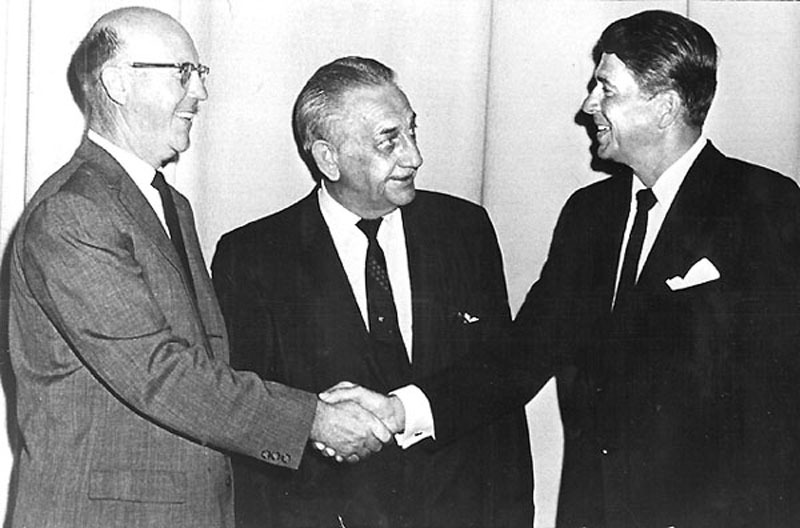 MacDougall, longtime Newhall Municipal Court judge, greet Ronald Reagan, president of the Screen Actors Guild, at the school auditorium in the early 1960s. Harris, in a June 2000 Signal interview when Harris was 90, said the occasion "was either '60 or '61, before (Reagan) was governor of California. I took a group of seniors in to hear him speak at the auditorium." The Henry Mayo Newhall Auditorium at Hart High School opened Sept. 12, 1952. It was closed following the Jan. 17, 1994 earthquake and reopened six years later. SG6001: 19200 dpi jpeg from smaller jpeg.